Carry all of your essentials in this elegant, fully lined medium cosmetic train case with zipper closure from “The Quilted” Collection. 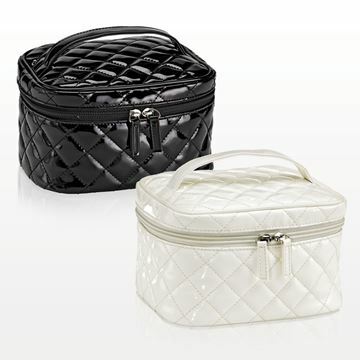 The polyurethane material is stitched with a quilted pattern and has a top handle for added portability. This train case also has a small inside elastic pocket for added convenience. Ideal to be sold at retail or offered as a gift with purchase.